At the back of the gallery, a recording of a three year-old girl’s voice reading a list of male first names fills the air: George, John, Tom, Jim... 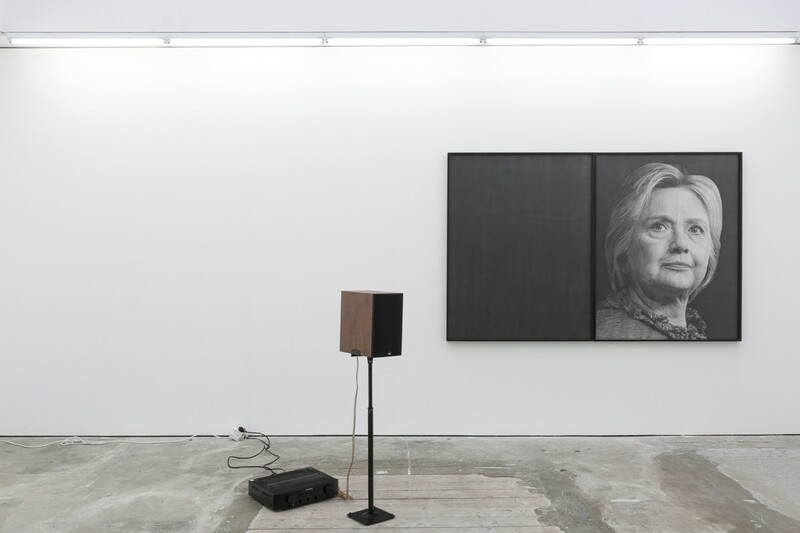 This is the audio component to Karl Haendel’s Hillary, a two panel drawn portrait of Hillary Clinton made in the year leading up to Donald Trump’s election. The voice is Haendel’s daughter, reciting the colloquial names of the forty-four presidents of the United States. The space of the portrait is doubled, so that on the right side of the picture plane the former Presidential candidate’s face is laboriously rendered in acute detail, while the left-hand side of the portrait is filled with an expanse of dark hand-shaded graphite, a void or negation.